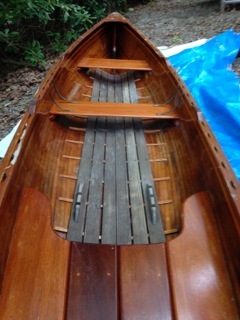 This handcrafted rowboat with double oarlocks was made by Robert Lincoln of RKL Boat Works in Mt. Desert, Maine and dates to the late 1980s or early 1990s. It came with our recent purchase of a lake house. Robert Lincoln's boats got great reviews - stable, light weight, expertly crafted and beautiful to look at - but he stopped making boats in the late 1990s. Custom bronze hardware and original builder's plaque. About 100 pounds and just under 14' in length. 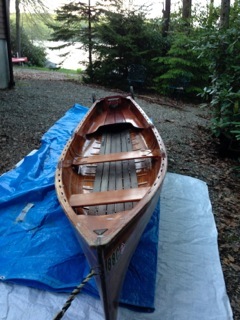 One set of Shaw & Tenney spoon oars with leather & hand trailer are included. 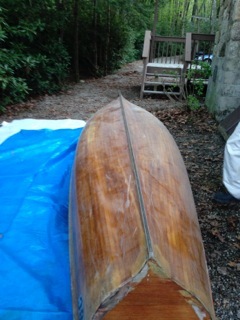 The inside is in fairly good shape with some of the hand laid fiberglass coming up in 2 corners. 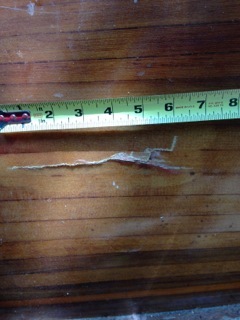 The outside needs refinishing and some wood may need to be replaced - there is a 7 inch horizontal crack. See the photos. We are located about 15 minutes south of Monticello, NY in Sullivan County.